Our much happier sleeper this morning! 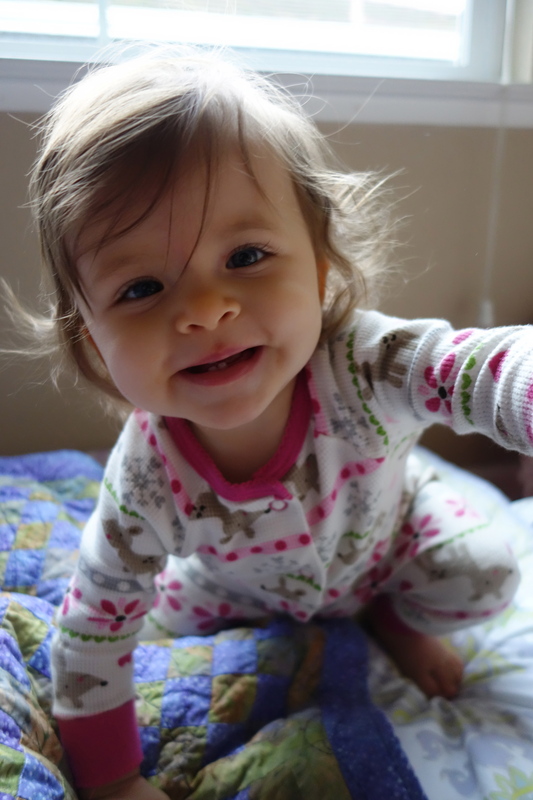 For the last couple months, I have craved a more consistent sleep routine with E. Co-sleeping served us well for nearly half a year, but she got to the point where I could no longer escape from bed after putting her down in the evening. This caused her bedtime to creep back later and later as she would reawaken when I would try to get out of bed without her. I dreaded nighttime because it meant hours of repeated attempts and usually ended with me so tired I would just give up and go to sleep with her, leaving zero adult time in the evenings and taking away valuable sleep from her routine. I knew as soon as we had our new place, I would have to start new systems, but I really dreaded the crib and crying it out. Friends had shared both the horrors of dealing with screaming (and vomiting) babies for several hours on end as well as the amazing leaps in sleep duration. It would be our last resort. Instead, I read up on the Montessori bed, and as I already shared, it was magic for naps, but not for bedtime. Then a friend recommended The No Cry Sleep Solution. While I am still waiting for our copy to arrive, I was able to glean enough from descriptions on the internet to get the point that repeated action is the key. For the past couple days, I have kept our day and sleep routine exactly the same. We wake-up, eat breakfast, nap, have lunch, take a long walk (getting outside is also supposed to help), nap, go through our dinner rituals, get cleaned up, and start the bedtime steps as soon as she shows the slightest sign of being tired, (even if that means 7PM!). We use the same vocabulary, pull out her comforting blankets and toys, and then lie her down to nurse over and over with the same words until she goes to sleep. I had heard recommendations of repetition in the past, but I had always felt like my attempts were enough. I would give up after a half hour or so, and allow her to come hang out with the grownups until she seemed tired enough to start the process again. Last night, I did not give up. For two hours, I repeated the steps, over and over, putting her little squirmy body back into her bed until finally, at 10PM she was asleep in her own space and I was able to go downstairs and sit in front of the fireplace with my husband. I realize it is still a little early to declare sweet victory, but for us, it felt like it. She slept three whole hours in her own bed AT NIGHT. This earned her an entire extra hour of sleep and did not require me to stay in bed with her like usual. From what I have read, if I continue this unrelenting repetition, the amount of time spent getting her to sleep should decrease, and I can already tell from the consistency of her naps over the last week we have made some real progress in getting her to sleep in her own space. What I did not expect, however, is how difficult it would be for us. Both my husband and I debated carrying her into our room when it was time for us to go to sleep last night. We could not wrap our minds around the idea of not sleeping with her after so many months of falling asleep with her between us. Still, we resisted the urge in hopes it would buy her more sleep than usual. For an entire hour, I lay awake in bed, unable to drift away without the warmth of her little body next to me. When she awoke screaming around 1AM, we both jumped out of bed, relieved and eager to have our little beast back with us. I guess we will eventually have to work on encouraging her to stay sleeping in her own bed when she awakens, but for now, it is exciting to think I may have my evenings back to myself, even if I find myself missing her next to me when it is time to go to sleep. Parenting is funny. We want so much for ourselves and our children, but often we are the ones dependent on old habits. I would never take back co-sleeping and the special bond it has created or the extra sleep it bought us in those first crazy months, but I also recognize it is time to do a little letting go for her good and mine. I just have to remind myself the benefits are worth the twinges of pain. Thanks Marla! I hope I’m right, I really need my evenings back 🙂 We’re making good progress, but it’s still not easy… Fortunately the book arrived in the mail yesterday, hoping to put all the tips/tricks to work. Do you have any favorites to share? I can’t say enough about how important that routine and repetition is. We were firm believers in that when our kids were that babies and infants and toddlers. Maybe not quite as stringent as what the book suggests, but we generally did everything we could to follow the same routine every day and every night. Meals around the same time, naps at the same time, bedtime at the same time with a routine that led up to it. My sister-in-law once tried to plan a family event for the early afternoon. My wife said we couldn’t do it then because that was our son’s nap time. My sister-in-law blew up at her because we should just skip his nap. We didn’t do it. The routine mattered. This never occurred to me until now, but maybe it stems from my own sleep difficulties. Because of the battles I had with insomnia earlier in my adult life, I adopted a bedtime routine for myself to “get ready” for sleep. We did the same things with our kids. Bedtime at the same time every night. Start it at the same time every night and generally go through the same process. That routine, repeated over and over every night, I think is critical to the success of the parenting endeavor with kids that young. Does it work all the time? Absolutely not. Will you probably have to adjust the routine on a regular basis? Probably so. Learn to spot it when the routine no longer works and made adjustments. That’s the biggest problem we had, particularly with our first born. The routine would work for a few weeks and then it wouldn’t and we’d pull our hair out for a few more weeks wondering why it wasn’t working anymore before we would tweak it and have success for a few more weeks again. That’s really interesting to hear! We have giggled in the past about people unwilling to bend sleep routines, but I am starting to get why. Naps make a world of difference when it is time to go to sleep at night. It’s interesting that you mention your own insomnia. In reading about baby sleep, I am learning a lot about human sleep in general, and it seems like you’re right– waking up at the same time everyday is supposed to make a huge difference. I’m also finding that getting outside for a long stretch of time to absorb the light also seems to matter. The night before last she slept 13 hours– then yesterday we were cooped up all day and she only slept 9. So interesting. We’re keeping at it. Supposedly it takes 10 days to find the right rhythm. My fingers are crossed. Yep. Once you have kids of your own you realize why those weird parents you snickered at in the past did what they did. It may be true that sunlight is important, but I also just think it’s also a function of the different activity levels when you’re inside versus outside. Rarely do people, particularly children, just sit around while they’re outside. Instead, they are running and laughing and skipping and are non-stop activity. Inside, they can be active too, but it’s a different level of activity. I wish you luck in the continued experiment that is parenting. There will be lots of twist and turns, but you are a step ahead of most because of how you are paying attention, re-evaluating and recognizing the need for adjustments as you go. I remember when I was a kid, my parents, particularly my dad made a regular habit of weekend naps. I thought that was weird, and kind of sad. I get it now. I hate how long it takes me to respond sometimes these days! That’s great that you used your own experiences with insomnia to support your kids in better habits/routines. I think you’re right about getting outside having to do with activity levels, although for her, right now, I think it’s more about regulating melatonin with sunlight since she just sits in her stroller. It is funny how the perspective changes once you experience the challenges yourself. It is still strange to me that we have to start getting her ready for bed at 630, but I’m forcing myself to adapt (I’ve always made dinner around 7 or later, so this is a big shift for my own habits!). It’s interesting to realize how much of the resistance is just me being stubborn in changing my old ways. I’m learning this doesn’t get me anywhere, though. And, as for naps, I’m a fan– although lately I refuse to take them because they are my only time to write! Yes. It’s 6:30 and the bedtime routine begins and you want to step back and say “really?” One thing I would add is that there is a long-term value in this. Once she starts school and has homework and plays sports and has music lessons and everything else that goes on, that you have already established the sense and need for a routine will be a big help. Good point on the routines mattering throughout life. I know that is true of many of my students and their struggles with completing homework in the absence of a routine. Better for me to adapt now than later, I suppose. Tonight I failed. We got home from dinner around 730 and it took me two hours to get her to sleep without the routine. C’est la vie I suppose. It can’t happen every day and every night. No failure there. Whatever it was you were doing last night was an opportunity and an experience. Dinner out or dinner with family or whatever it was. The key is that the routine is present more often than it isn’t. By the way, your little girl is precious. Well, she is, and I can also tell she has mischief in mind as well. Lucky you. Haha, yes, lucky me. Exactly what I asked for– I’ve always liked the mischievous kids best, even if that comes back to bite me sometimes… But, you are definitely correct, she’s trouble, in a good way. Your doing great both of you. Much harder to get her to sleep in her bed when she starts talking. Trust me made same mistake with both kids. Love you Alex lol. Thanks Cathy 😉 She’s getting more sleep and I’m getting more time to myself, so we’re both winning on this one!